When Jacksonville native Astreia Mitchell Bauer met her now husband Jesse Bauer twelve years ago, the couple had an exciting journey ahead. Through an overseas deployment, three children, and several moves, the Bauer family has come to settle in World Golf Village’s King & Bear and is loving every minute of it. We recently caught up with Astreia to learn more. How long have you lived in World Golf Village? We moved to the area in July of 2011. We rented a home in King & Bear for a little over two years. We loved it so much that we purchased here in September 2013. What is your favorite aspect of living in World Golf Village? There is a true sense of community here. Folks will wave as you walk or drive by. Neighbors are willing to look out for your home and children if you need them to. The families we have met here are so open and have genuine hospitality. The neighbors we have met have become lifelong friends. How did you and your family come to call World Golf Village home? I am originally from Jacksonville and my husband hails from Eau Claire, Wisconsin. He and I met when we lived in Atlanta in 2002. After relocating to Tampa and then Jacksonville, we decided to find a new place to call home. While house hunting, I came across a few listings in St. Augustine and decided to check them out. When we saw the home in the King & Bear, my husband was sold. Jesse has certainly had a busy career. Tell us a bit about it. Jesse enlisted in the Army Reserves when he was 20 and worked in Wisconsin before transferring to Atlanta to work with Curt Manufacturing in 2002 – the same year we met. He transferred military units and continued to attend drills and training. He deployed to Kuwait on Valentine’s Day 2003 and returned safely 12 months later, which was one of the hardest things we have endured as a couple. After we were married in 2005, Jesse earned a promotion as Curt’s Territory Sales Manager for Florida and we moved to Tampa, then later to Jacksonville. 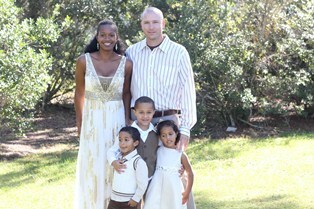 After eight years of service, he left the Army in 2006. This month, he is celebrating 12 years with Curt Manufacturing. You also have an interesting and diverse professional background. I have a degree in Fashion Merchandising and worked for Saks 5th Avenue, Casual Corner, and Betsey Johnson, as well as two years with Toys R Us. In 2003, I shifted gears to work in Operations for Drive Time, a financing car dealership. 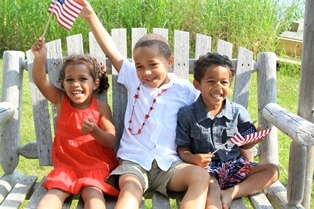 Since 2010, I have been at home with our children. I launched a small photography business in 2012, Astreia.B.Photography (www.facebook.com/astreiabphotography) to fuel my creative outlet, but I will wear the title of SAHM for a few more years. Tell us about your family. 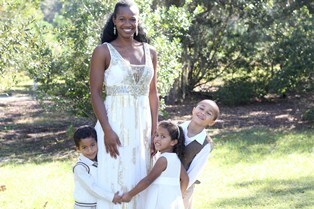 Our crazy, beautiful, close-knit family consists of our 3 children: Jackson (5) and twins Anderson and Amaya (3). Jackson is in Kindergarten at Wards Creek Elementary and I am “home-schooling” the twins to prepare them for VPK in 2015. We love our kids and they are such a blessing to our lives, but there is rarely a dull moment at our house! What do you like to do in your free time? I’m very artistic and I like anything creative including photography, painting, and repurposing furniture. I also love to work out – running, yoga, Zumba, weightlifting, you name it, I love it! Jesse loves to run, fish, and play golf. Family is also very important to us so we spend a lot of time doing family activities like reading together, bike rides, movie nights, picnics, and trips to the park and the beach.